An electric smoker could take your food prep up a few notches in 2019. Even though this kind is considered cheating in the smoker world, it is still the most widespread today due to some major reasons. For starters, the best electric smokers have the easiest temperature control out of all the models, which in meat smoking is the most important aspect. Furthermore, you won’t have to keep adding charcoal into it to keep the fire burning, just plug it in and you’re good to go. Oh, on that note, yeah… You will need an electric supply. This is the Achilles’ heel of these smokers. With the rest you can go literally anywhere and fire them up (except maybe some propane and pellets models), but here you have to have a power supply. Sure, you can bring an external battery, but it still isn’t as convenient as with the rest. They also tend to be a bit heavier and have more parts that can eventually break. 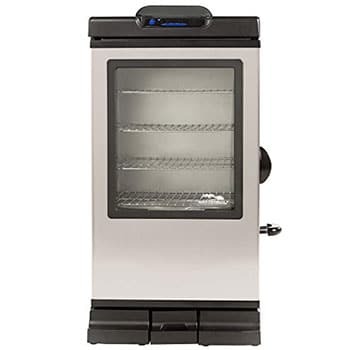 Our top rated electric smokers are easy to use and clean, affordably priced, and good at maintaining their temperature. How do you know which models are best for you? This review is a great place to start. 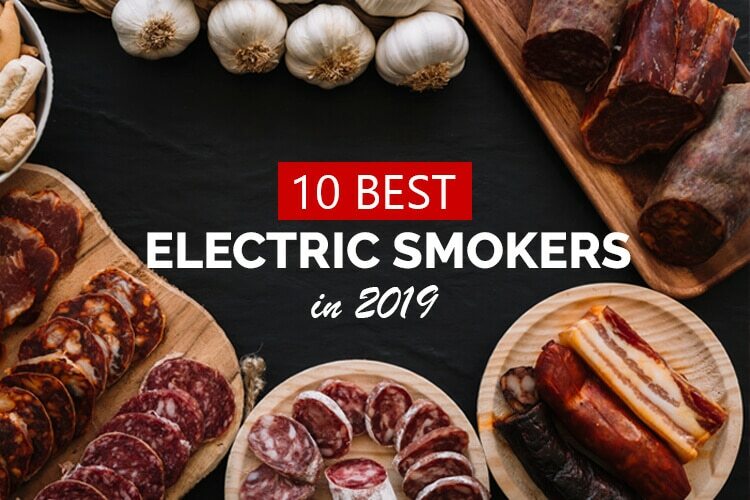 Here is a complete list of the highest rated electric smokers for 2019 that will help you find the right one for your needs. This smoker made by Bradley is the perfect combination of quality materials and brilliant technology. It can smoke on its own for 8 straight hours and requires no previous knowledge of meat smoking. It has tons of customizable features and is the only smoker out there capable of both hot and cold smoking. It’s built well and maintains a steady temperature and smoke. With the BTDS108P you will always be on top of your meat smoking game. We do wish that it had wheels so that it was easier to move. We also felt that it’s best suited to a more sheltered area on the porch or patio. This six rack smoker provides plenty of space for cooking in large quantities and doing different cuts of meat simultaneously. The digital controls make for a simple cooking process without all the guesswork of analog models. There is even an easy to remove ash catcher that makes cleanup a breeze. 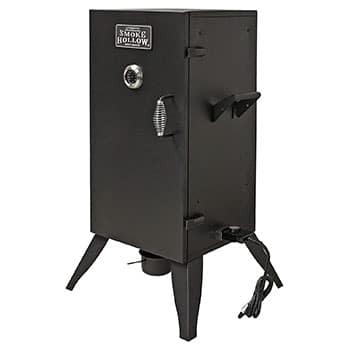 The smoker clocks in at right around 60 pounds but it doesn’t have any wheels or rollers that can be used to position it properly. It’s an outdoor model, but heavy wind does affect the overall performance. Want to learn more? Check out our in-depth review here. Landmann has always been known to produce good quality products. The Smoke Mountain is no exception to this rule, as it covers everything a basic meat smoker should do. 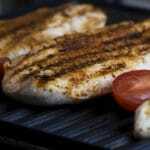 It has relatively good heat insulation and doesn’t mix up different flavors when cooking fish and chicken meat together, for example. If you don’t want to rip a hole through your pocket, but also want to enjoy a tasteful BBQ, go with this one. The Smoky Mountain is a budget-priced powerhouse of an electric smoker that handles temperatures between 100 and 260 degrees Fahrenheit. It also has four separately adjustable feet that allow you to ensure the unit maintains its upright positions at all times even on uneven ground. The 3-in-1 water pan, wood chip box, and grease drip tray make operating the Landmann Smoky Mountain a simple process. Cleanup is also easy thanks to the 3-in-1 compartment setup. The window in the door is also nice, so you can keep an eye on your food without opening the door and dropping the internal temperature. On the downside, the power chord is rather short, and the controls don’t allow for much fine-tuning. The door is also prone to leaking smoke due to its loose fit. 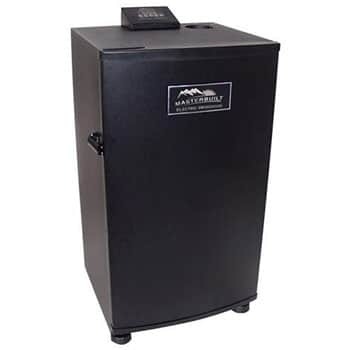 All in all, the Smoky Mountain gets the job done and is an easy recommendation for those looking to prepare smoked meats at home without having to shell out a ton of cash. The Char-Broil Deluxe series offers you a great user-friendly experience which will take all the work you have to do away. It has a gorgeous design and is made out of top-quality materials. The smoke and temperatures with which it operates ensure that the meat coming out of it will be nothing but extraordinary. It’s affordably-priced and comes with features that you’d usually expect to pay more for. It’s an excellent choice for beginners and won’t break the bank. Bear in mind If you’re into high-temperature cooking, it’s not the best option. It reaches a maximum temperature of 275°F. It’s an option that is well worth considering if you like slow-cooking, however. Throw in some and you are all set for the weekend. It is rare to see a product this good, which does almost everything right, but Masterbuilt have seemingly “mastered” this process. It has a built-in thermometer so you can choose the perfect temperature every time. It ranges in temperature from 100° F to 275°F. The controls are on a digital panel at the top of the unit, so they are easy to read. There are four racks in total giving you plenty of cooking space. If you don’t feel as though that’s enough, upgrade to the 40-inch model instead. You do need to be careful when using the wood chip insert because it’s not as strong as we’d like. We’d also have preferred at least a year-long warranty (you get a 90-day guarantee). The Masterbuilt 20078715 has all the bells and whistles a smoker can have, but for a much lower price than its competitors. This smoker isn’t as fancy as all the rest on our list, but the guys over at Smoke Hollow didn’t want it to be. All it has to do is give you the pleasure of a nicely smoked meat, without having a steep learning curve. 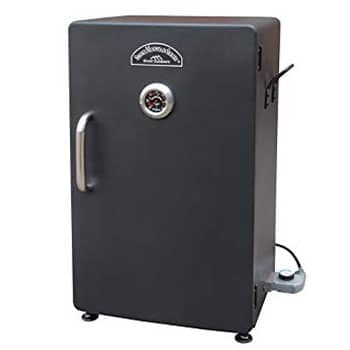 If you want to get a cheap first meat smoker which will guide you deeper into the world of meat smoking, opt for this one. This is smaller than the Masterbuilt, so if you need more space, it’s best to go for the 30-inch model. It does have chrome-plated racks, but there are only two of these, which means it’s not ideal if you’re cooking a lot of food at once. If you’re cooking for smaller groups, it’s perfect. You get a reasonable smoker, and you’ll save a few bucks. 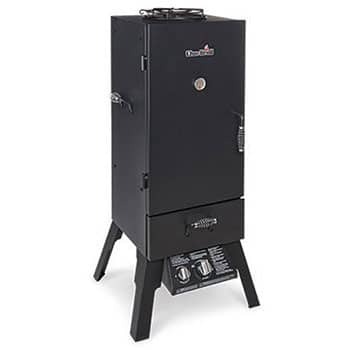 If you’re short on space, though, this smoker model is the best option. It’s compact, works well, and is easy to use. Like the Masterbuilt, though, it only has a 90-day warranty which was disappointing. The Masterbuilt Bluetooth Smoker is a great little piece of equipment for making homemade smoked meats. It offers the ability to monitor and control the cooker from afar using the smart device app. The app is a bit finicky, but the functionality is very handy when you can get it to work. This model also packs a punch with its 800-watt heating element that helps keep the temperature constant during long cooking sessions. However, it does have a max temperature of 275 degrees so that might be a deal breaker for some. I prefer to smoke my meats at low temperatures over long durations, so it wasn’t a problem at all for me. Due to the Bluetooth functionality, the Masterbuilt Bluetooth Smoker is a little bit pricier than similarly sized products thanks to the “high end” features it has. Personally, I could do without the Bluetooth and smart device functionality after spending some time with the rather frustrating app they made for it. If the app worked better and was more reliable, it would be a much easier recommendation. Overall, I’d say the unit is worth the price and will certainly get the job done. Bluetooth technology that lets you control and monitor from your smart device. 800-watt heating element for consistent temperatures. Max temperature of 275 degrees. The Smokin-It Model 2 electric smoker is a very well-built and sturdy piece of equipment that is sure to provide you with a solid at home smoking experience. The construction is top notch with all the components being quite sturdy and reliable. 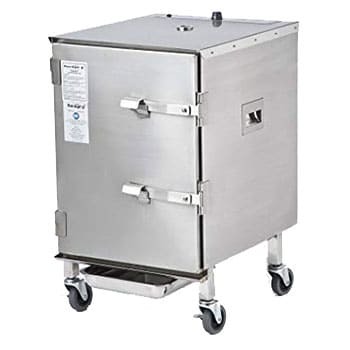 The form factor of this smoker also makes it perfect for storing in tighter spaces, and it’s really easy to move the whole smoker around thanks to the wheels and stainless steel handles on the sides. This thing weighs quite a bit though, so using the wheels is a must, and if you need to pick it up, you should probably have a buddy help you out. While this thing does cook like a champ, it is a fair amount pricier than other models with similar sizes and capabilities due to the build quality. The temperature gauge is really close to the heating source which can result in temperatures in the majority of the smoker being lower than what is read by the gauge. The entire unit is a little on the small side and only has four racks which means you won’t be able to use this for big productions. Full stainless steel construction for extra durability. 800-watt replaceable heating element with superb insulation. High price due to stainless steel construction. Temperature control isn’t the most accurate thing in the world. Only four cooking racks and on the small side. The Old Smokey electric smoker isn’t the prettiest thing ever, but it gets the job done. This model is a reliable piece of equipment that should help you make delicious smoked foods for years to come. It is made with a very utilitarian design without any unnecessary frills or features. The Old Smokey was perfect for me as a novice to the smoked foods world thanks to its simple design and no fuss operation. It can be a bit of a chore to clean compared to the units with easy cleaning features like drip drawers. However, the lack of features keeps the price down, and this baby works great. It is a bit on the small side so you won’t be cooking up a storm for huge crowds with it, but it will definitely get the job done for whole turkeys or a couple racks of ribs at the same time. Low-cost thanks to the no-frills design of the unit. Does its job without fail and is sure to provide great food. 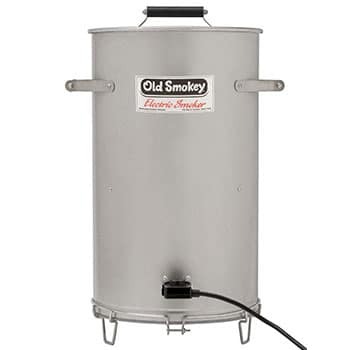 Perfect starter smoker for those just getting into the hobby. Small size and lack of features means you’ll want to cook one thing at a time in it. Cleaning this piece of equipment is a bit of a chore due to the design. Finding an electric smoker that comes in at under $200 is not all that easy. This is a simple, budget-friendly model. Naturally, the trade-off for the great price is a very simple device. You’ll also need to factor in that it’s a little smaller than some of the more expensive options. That said, it’s an excellent option for a beginner who just wants to test the waters. The downside is that the door can be difficult to shut correctly at first. Once you get the hang of it, though, it becomes simpler. It’s also not the best-insulted model and so would not be ideal if you’re in an area that gets very cold in winter. There is some insulation, but this does not stand up too well to extremes of cold. Also, the lack of insulation does mean that it can cost a little more to operate regarding power. It’s not a huge difference, though, and certainly not a deal-breaker. We do think that if you enjoy smoking your food, you’ll want to swap it out for a more advanced model at a later stage. If you’re only going to use it occasionally, this model is perfect. 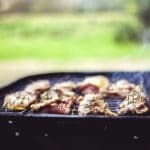 If you’re a more experienced smoker or are going to use the smoker often, it makes sense to up the ante a bit when it comes to price and quality. This model performs well and won’t cost you an arm and a leg. It has some handy features that make it easy to use. Capable of handling smaller racks of ribs and pieces of meat. You could, for example, fit in six whole chickens. We don’t particularly like the tray that you put the wood chips in. We do feel that this could have been made a little stronger. Still, as long as you’re careful when using it, it should be fine. Another issue is the temperature range that this model is capable of. It only goes up to 275°F, so it won’t work if you want to try some high heat cooking. All the same, for the price, you’re getting a pretty good deal. It’s more than enough for someone who is just starting, and it can handle a reasonable amount of food in one go. Obviously this guide will be concentrated on the electric kind, but we have to mention the others. There is a reason that today the most commonly used smokers are the electric ones, and you will see why in a second. There are a lot of boxes that have to be checked when searching for the perfect smoker for you. That’s why we’ve arranged and listed them all in one place. Make sure you go through all of these when making your purchase. This is one of the most important aspects of an electric cooker. Always check this first. Even if the smoker has tons of other amazing features, if it is not big enough for your needs it just won’t be useful. If you often cook for big crowds or parties, make sure you get a big enough smoker to fit all the food inside. Make sure that the model you choose is user-friendly and a breeze to operate. Make sure the control panel gives you enough options and lets you monitor the situation inside the cooker. Extra points if there is a Bluetooth interface or even a remote control. What you want is a durable cooker which will be by your side for years to come. Avoid smokers that have bad reviews or proven short longevity. Make sure the smoker goes from around 100 to 500 degrees Fahrenheit. This range consists of all the right temperatures when smoking all sorts of meat. This seems like a weird thing to point out but trust us, if you want to use it at different places there are two things you need out of your smoker – to be lightweight and to have wheels. Make sure you get a good warranty on your product. Most smokers have a warranty between 1 to 5 years, but we suggest getting the longest possible one. After all it’s an electric unit and everything can go wrong within its circuits. Temperature Control. Charcoal smokers are famous for being hard to maintain at the right temperature. Gas variations are quite better, but still not as good as the electric models. They simply have tons of heat-regulating mechanisms which all do the job for you. There is a proper temperature for each kind of meat and the electric models make sure you maintain that temperature for the perfect result. Safety. These smokers are the safest out of all the types, as there is no possibility of burning wood jumping out and setting things on fire (especially if you are indoors). Even if something happens to the thermostat and the temperature goes beyond its set point, there are prevention mechanisms that kick in and shut it off. Not Having To Start A Fire. All you need to do here is plug in the cooker into a power outlet and that’s pretty much it. 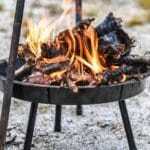 With the charcoal cookers you will have to actually make a fire and maintain it properly. Not Having To Supervise It. Electric cookers require minimal to no supervision. If you can’t have your whole day wasted in maintaining the smoker, this is the right choice for you. You just set up the ideal temperature or program for you and go do whatever you were doing in the first place. One thing, though – since the temperature in the electric models goes from the bottom of the unit towards the top, the whole process might be a bit slower, but even then, as experienced smokers say, “the longer the smoking is, the better the taste”. Heat Spreading. Electric cookers are a unanimous champion in that category. 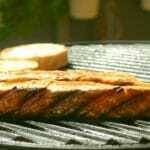 Most units cannot distribute their heat properly (especially when outside), and usually cook only one side of the meat. Electric models have an excellent heat spreading capabilities which results in a nicely cooked and smoked meat. A variation of the electric smoker is the pellet one. It still uses electricity but maintains its temperature by burning compressed wood. They are great as they tend to add a bit more flavor but they are far more expensive. All that aside, electric smokers are what smoking should be all about. You place the meat inside and go prepare the rest of the dinner and enjoy your family-time. Nothing to maintain, nor there is anything to worry about. The propane gets rather close to that, but we’d suggest always keeping an eye on your propane smoker just in case. Electric smokers provide you with the ability to make delicious, smoked meats and cheeses at home while taking out a lot of the guesswork that goes into traditional smoking. 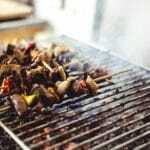 Cooking smoked food is a great hobby that your family and neighbors are sure to love, but getting into it can be a process of trial and error at first. We’ve put together some helpful tips for helping you to hit the ground running with your new electric smoker. When it comes to smoking food, too much smoke is not a good thing. 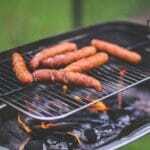 Ideally, you want to see a thin trail of blue smoke coming out of the vent on your smoker during the entire process. It doesn’t take a whole lot of smoke to imbue your food with the lovely, rich and smoky flavors you want. Make sure you aren’t going too heavy on your wood pellets or chips when smoking. This is especially true for chicken or turkey as they are more prone to soaking in the smoke and can even become inedible with too much smoke. First of all, make sure the smoker has had plenty of time to cool completely because you don’t want to burn yourself! Using a cloth with warm, soapy water is generally the best solution for cleaning out the inside of the smoker. Different models have various compartments that can be removed like drip pan drawers and wood chip trays so make sure you take out all the racks and compartments and clean them separately – this will make the process much easier. After wiping everything down with the warm, soapy water, it’s generally a good idea to dry everything off before putting it all back together. Prevent food from burning onto the components by spraying down racks with vegetable oil before each use. 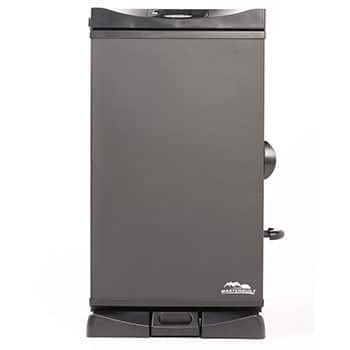 Pellets smokers seemingly are on the rise lately, but are nowhere near as popular as their pure electric competition. Even so, they can maintain temperatures rather well too. 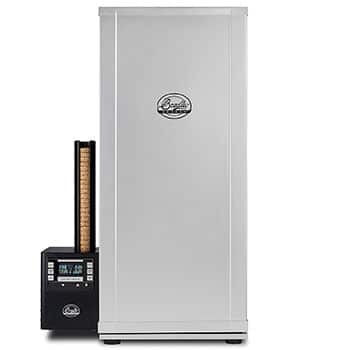 The pellet smoker is basically a modified electric smoker. Most of them have an auger system which has a thermostat attached to it. That way, whenever the temperature drops, the auger system places a few more pellets into the fire. If you want that system in your smoker, though, you will need electricity. Those models are made for people who want their meat to be smoked over true wood (not that there is any difference in the taste). The pellet smokers don’t have any cheap models, so honestly, if you are now starting with smoking, pure electric models are the way to go. Speaking of flavor, charcoal smokers produce quite the unique combination of tastes embedded into your meat but the whole process of starting them up and later on maintaining their temperature is a huge deal-breaker. Instead of being with your friends, you will have to sit next to the smoker constantly in order to produce the same result an electric model would do all on its own. Some BBQ “experts” will say that charcoal is the only true way of smoking, but we’d strongly and respectfully disagree, as the meat which we tasted out of some of the higher specced electric cookers was brilliantly tasteful. Q: What is the water pan for? A: The water pan is used to help prevent food from drying out during the smoking process. You can put water or juice in the pan for extra flavor, but make sure you clean out the pan between uses to prevent bacteria from building up. Q: What kind of wood should I use to smoke with? A: The type of wood you choose is based on taste preferences, and different types of foods have some classic pairings. Mesquite is popular for cooking hams or bacon for instance. You should use either wood chips or pellets designed for smokers when using your electric smoker. Q: Are there other things a smoker can be used for besides smoking meat? A: Absolutely! Cheese is a popular food for smoking, but you can also use your electric smoker without any wood chips or pellets and just use it as a way for slow cooking food or dehydrating to make jerky or similar items. The smoker is a versatile piece of equipment great for making all sorts of dishes other than smoked meats. The best electric smokers is subjective as everybody has different requirements out of their cooker but we hope that the points laid out here will help you choose the right one for you. Even so, the models we presented are the current market leaders and we vouch for them, as they’ve been tested thoroughly in all sorts of conditions, and have passed every test with flying colors. Overall, the right model for you will depend on what features you’re looking for. If you’re into controlling every aspect yourself, the Smokin Tex Pro is a good option. It doesn’t have a timer, so you manage every stage of the process. If you prefer a set it and forget it option instead, consider looking into the Bradley model. 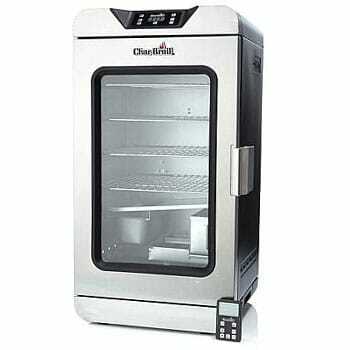 If you’re looking for something that can handle a lot of food, the Masterbuilt model is ideal. Just choose what’s most important to you. With any of the options listed above, you’ll be a master smoker in next to no time.